First, you should learn as much as you can about all your choices. There are many different ways of caring for a mother and her baby during labor and birth. Birthing care that is better and healthier for mothers and babies is called “mother-friendly.” Some birth places or settings are more mother-friendly than others. A group of experts in birthing care came up with this list of 10 things to look for and ask about. Medical research supports all of these things. These are also the best ways to be mother-friendly. Here’s what you should expect, and ask for, in your birth experience. Be sure to find out how the people you talk with handle these 10 issues about caring for you and your baby. You may want to ask the questions below to help you learn more. Mother-friendly birth centers, hospitals, and home birth services will let a birthing mother decide whom she wants to have with her during the birth. This includes fathers, partners, children, other family members, or friends. They will also let a birthing mother have with her a person who has special training in helping women cope with labor and birth. This person is called a doula or labor support person. She never leaves the birthing mother alone. She encourages her, comforts her, and helps her understand what’s happening to her. If they give mother-friendly care, they will tell you how they handle every part of the birthing process. For example, how often do they give the mother a drug to speed up the birth? Or do they let labor and birth usually happen on its own timing? They will also tell you how often they do certain procedures. For example, they will have a record of the percentage of C-sections (Cesarean births) they do every year. If the number is too high, you’ll want to consider having your baby in another place or with another doctor or midwife. Here are some numbers we recommend you ask about. They should not use oxytocin (a drug) to start labor for more than 1 in 10 women (10%). They should not do Cesareans on more than 1 in 10 women (10%) if it’s a community hospital. The rate should be 15% or less in hospitals which care for many high-risk mothers and babies. A Cesarean is a major operation in which a doctor cuts through the mother’s stomach into her womb and removes the baby through the opening. Mothers who have had a Cesarean can often have future babies normally. Look for a birth place in which 6 out of 10 women (60%) or more of the mothers who have had Cesarean go on to have their other babies through the birth canal. Mother-friendly birth centers, hospitals, and home birth services are sensitive to the mother’s culture. They know that mothers and families have differing beliefs, values, and customs. For example, you may have a custom that only women may be with you during labor and birth. Or perhaps your beliefs include a religious ritual to be done after birth. There are many other examples that may be very important to you. If the place and the people are mother-friendly, they will support you in doing what you want to do. Before labor starts tell your doctor or midwife special things you want. In mother-friendly settings, you can walk around and move about as you choose during labor. You can choose the positions that are most comfortable and work best for you during labor and birth. (There may be a medical reason for you to be in a certain position.) Mother-friendly settings almost never put a woman flat on her back with her legs up in stirrups for the birth. Mother-friendly places and people will have a specific plan for keeping in touch with the other people who are caring for you. They will talk to others who give you birth care. They will help you find people or agencies in your community to help you. For example, they may put you in touch with someone who can help you with breastfeeding. Experts say some methods of care during labor and birth are better and healthier for mothers and babies. Medical research shows us which methods of care are better and healthier. Mother-friendly settings only use methods that have been proven to be best by scientific evidence. Sometimes birth centers, hospitals, and home birth services use methods that are not proven to be best for the mother or the baby. For example, research has shown it’s usually not helpful to break the bag of waters. Here is a list of things we recommend you ask about. They do not help and may hurt healthy mothers and babies. They are not proven to be best for the mother or baby and are not mother-friendly. They should not keep track of the baby’s heart rate all the time with a machine (called an electronic fetal monitor). Instead it is best to have your nurse or midwife listen to the baby’s heart from time to time. They should not break your bag of waters early in labor. They should not use an IV (a needle put into your vein to give you fluids). They should not tell you that you can’t eat or drink during labor. They should not shave you. They should not give you an enema. A birth center, hospital, or home birth service that does these things for most of the mothers is not mother-friendly. Remember, these should not be used without a special medical reason. The people who care for you should know how to help you cope with labor. They should know about ways of dealing with your pain that don’t use drugs. They should suggest such things as changing your position, relaxing in a warm bath, having a massage and using music. These are called comfort measures. Comfort measures help you handle your labor more easily and help you feel more in control. The people who care for you will not try to persuade you to use a drug for pain unless you need it to take care of a special medical problem. All drugs affect the baby. Medical research does not show a need to circumcise baby boys. It is painful and risky. Mother-friendly birth places discourage circumcision unless it is for religious reasons. The World Health Organization made this list of ways birth services support breastfeeding. They tell all pregnant mothers why and how to breastfeed. They help you start breastfeeding within 1 hour after your baby is born. They show you how to breastfeed. And they show you how to keep your milk coming in even if you have to be away from your baby for work or other reasons. They encourage you to feed your baby whenever he or she wants to nurse, rather than at certain times. They should not give pacifiers (“dummies” or “soothers”) to breastfed babies. They encourage you to join a group of mothers who breastfeed. They tell you how to contact a group near you. They have a written policy on breastfeeding. All the employees know about and use the ideas in the policy. They teach employees the skills they need to carry out these steps. Would you like to give this information (and more) to your doctor, midwife, or nurse? For a copy of both this brochure and the Mother-Friendly Childbirth Initiative by mail, send a stamped, self-addressed envelope with $5 (US) to help cover the costs ($6 Canada or Mexico, $10 all others). 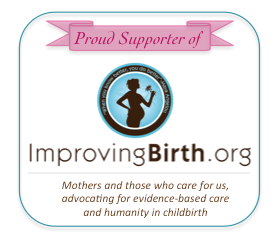 © 2000 Coalition for Improving Maternity Services (CIMS).